Crack open that box, smell the rich chocolatey aroma, and come inside to our September 2014 box! We really hope you enjoyed the chocolate bars in this box. We included one delicious and super-healthy chocolate bar, one sweet, fruity bar, and one bar with some berries embedded in it. We’d love to know what you thought of each bar — please leave a comment and let us know. It’s very healthy and fits in with our healthy chocolate eating guide. The flavors are quite exotic and not something that you find in most chocolate bars. Yes, green tea and spirulina, that’s the flavors in this bar. Again, not something that you find in your standard chocolate bar. We really hoped you like this bar — personally, I love the combination of chocolate and greens, and I hope you do too! The thing to keep in mind with this bar, and most other dark chocolate bars, is that they aren’t supposed to be sweet, sugary “dessert” chocolate bars. While they are sweeter than, say, a grilled chicken breast, they aren’t meant to be as sweet as a piece of chocolate cake (whereas a normal milk chocolate bar will be that sweet, or close). Plus, it’s genuinely good for you (as long as you don’t eat the whole bar at once). Vosges means “house of crazy chocolates” in Swahili. Actually, it doesn’t. I made that up. However, Vosges does make lots of very high-quality chocolate bars with very interesting ingredients (like green tea and spirulina). They have a few physical boutiques around the country — definitely try to check those out if you’re in Chicago, New York, Los Angeles, or Las Vegas. Biting into this bar gives you two delicious flavors all at once — one, the smooth dark chocolate and two, something a bit fruity perhaps? Then there’s that slight crunch — what is that? We LOVED this bar… let’s see what it was…. We love this bar because it tastes like you’re eating a chocolate covered strawberry. Well, this is more chocolate than strawberry, but that’s what it reminds us of. However, to be honest, we can’t really taste the champagne in this bar. Could you? We still think the strawberries are more than enough to make this a delicious bar. Not exactly known for being a chocolate bar producer, World Market actually has some really nice chocolates. Who knew? This one MIGHT have been a little bit of a giveaway since the berries in this bar were on the outside and easily visible… however, it isn’t a common berry, so that might have made it a little bit tougher to guess. Personally, I thought the goldenberries tasted slightly like raisins. Anyone else? Anyway, we loved the rich, minimalistic chocolate bar and the goldenberries added a great contrast against the dark chocolate. 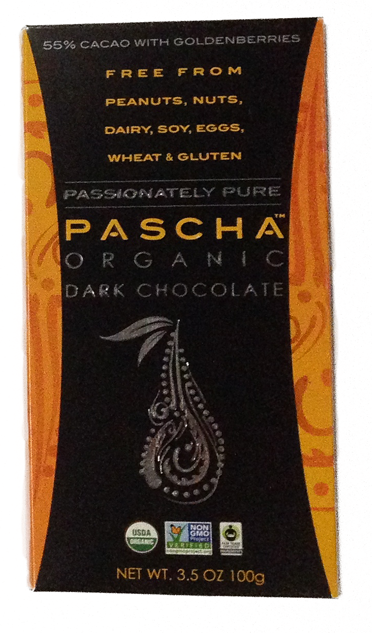 The zen masters of chocolate making, PASCHA focuses on purity and minimalism. They believe that chocolate is already a complex compound and needs very few added ingredients to go along with it. So they add only what is absolutely necessary to create a delicious, healthy bar and nothing more. They’re also a bean-to-bar chocolate maker, which means they control the entire process. We hope you LOVED this box! Leave a comment to let us know what you thought about it. 2 Replies to "Mystery Chocolate Box September 2014"
We still got together and did a taste test, but they probably would have tasted better if they didn’t melt first! Let me just say that we LOVE vosges chocolate and visited the store in Chicago. Although I did not love this bar, I am happy that you included a vosges bar! Bar B…My ABSOLUTE FAVORITE! 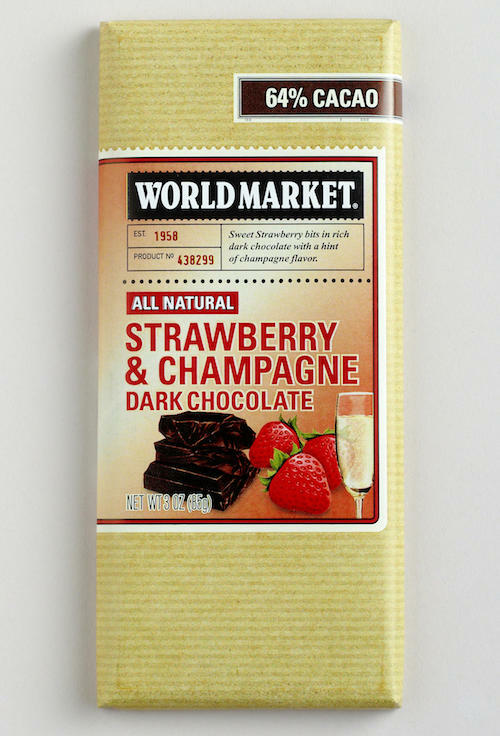 I was so excited to see that it was a World Market bar, because we have World Market right down the street, and I will be stocking up on this bar!! Bar C…everyone elses favorite bar, I HATED it, and I also tasted raisin. Oh no! We’re super sorry that the bars arrived melted — let us know if you want replacement bars. We are definitely looking into better ways to cost-effectively ship the bars during warmer months.